LSBU film student Thomas Davis has backed up his NME award nomination with another success, trending on YouTube with his latest music video for rapper RAT BOY. In January, Thomas’s clip for RAT BOY’s ‘Get Over It’ was nominated for Best Music Video, and now they have collaborated again for the recent release of ‘Revolution’. The video was among the likes of clips by Paramore and Lana Del Rey when it made it to number 11 on the YouTube trending charts on the day of its release. Thomas, who was drawn to study at LSBU for the industry-standard equipment and facilities available to Film Practice students, said working with RAT BOY meant he had the freedom to be creative. “I have been working with RAT BOY and Parlophone records since last January, and have been on tour with them, shooting all of their social media and tour video content, as well as directing and shooting all of their official music videos,” he said. “We all work as team, we write the concepts for the videos together, and we sit through the edits and the grading together. It's one big collaborative process. While the video is fun, it doesn’t shy away from tackling tough subject matter, as Thomas explains: “It's basically the day dream of a young person in a post-Brexit, broken Britain,” he said. 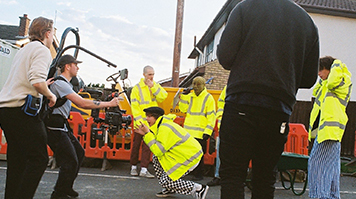 Thomas shot the video with the use of LSBU’s Arri Alexa Mini camera and said he hoped to continue working on music videos following the completion of his studies. The RAT BOY – Revolution music video can be viewed on YouTube. Learn more about studying Film Practice at LSBU.